In keeping with the long tradition of the Oystercatcher, Chef Tyler strives to cook simply, and to cook simply good food. 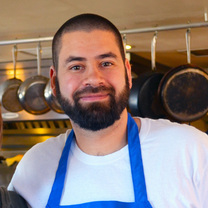 He began his cooking career as an intern at the age of 15 at Boulder, Colorado restaurants, working his way up from peeling potatoes to becoming a line cook. "Must be spring time...pea pod sorbet with rosemary blossom." "Limited run of our oat porridge cider bread. #the_oysterca"